Firstly, my apologies to Toolbox Members for running so late with this issue of the Toolbox eNews Update. There has been a lot happening in recent months (in particular within the ATAA, with which some of you may be familiar). Strategy ideas - One of the issues for investors from time to time is trying to decide in which one of several stocks to invest. One of the ways to do this is by using some form of comparison of share price performance (or price strength) over a time period. But which tool? And over what time period? The sample price chart shown here (click on it for a larger image) shows one of the tools available to do exactly this. For this edition of the eNews I have written a new eBook (PDF) Article and updated an existing one. And I will be expanding on this in the next issue of the eNews (due almost any week now). See all the details in this edition's focus section below. There are many different strategy ideas that investors can consider when selecting stocks for investment. This material will help to clarify some of the options. (two banks and their sector index). of stocks, and with their sector index, is the Comparative Percent Performance tool. This is shown in the sample price chart above and reproduced a little larger at right (click on the image for a larger version). 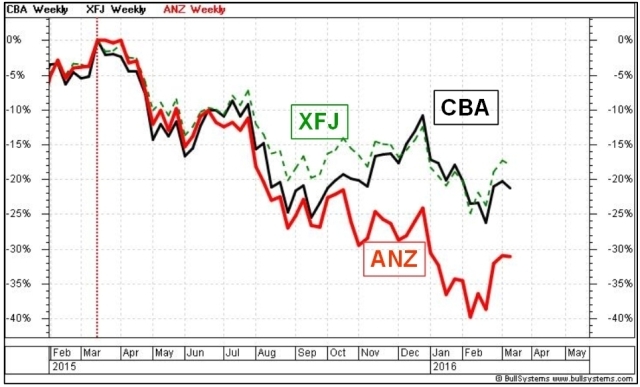 This sample chart simply shows the percentage change in share price of two banks (CBA and ANZ) between March 2015 and March 2016, and the same for their sector index (XFJ). This is discussed in the relevant eBook Articles, as well as the question as to which date should we use from which to start the comparison. eBook Article ST-6270, "Strategy ideas - Strength comparison" - This new 5-page article discusses the chart above, and the key elements and issues. Non-members can see the free page 1 here. eBook Article TA-4510, "RSC chart indicator" - This article was originally 6 pages and written in 2013, and has now been revised with updated charts, and a better explanation of the RSC chart indicator (and is now 7 pages). Non-members can see the free page 1 here.